Oh, answer boxes. Position 0 for the majority of its existence has been mystifying as Google seems to reserve this spot for websites that just happen to get lucky. 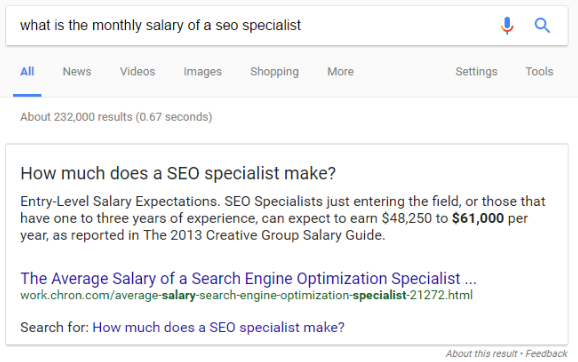 However, as more answer boxes are appearing in SERPs, we as marketers have the opportunity to obtain these highly coveted positions. In this post, I’ll share how answer boxes first came about, why formatting is crucial for answer boxes and lastly, a real-life example of how Seer has helped a client appear in position 0. In 2015, Google released the Hummingbird update which changed the search algorithm and improved the way Google helps its users. Instead of heavily relying on keywords to determine rank for answer boxes, Google began prioritizing user engagement metrics to help determine which website would earn the position 0 ranking. With the recent release of RankBrain, Google is now able to bridge the gap between short-tail and long-tail keywords, making answer boxes even more effective at directly answering users’ queries. The answer box (pictured) now highlights the answer to the user’s searched question. What do algorithm changes mean for answer box optimization? For starters, we know that answer boxes are appearing for more queries than ever before. This means that companies have a major opportunity to rank in Position 0 for direct long-tail and short-tail searches to ultimately address users’ questions more thoroughly. Check out the example answer box formats below. The type of content that typically ranks here is structured in a definitional, simple straightforward answer. Keep in mind that paragraph formats are the most common type of answer box. If Google does not have the desired format (table or list) to pull from existing website content, it will revert to paragraph style answer boxes. When reviewing the SERPs for the types of answer boxes ranking for a certain query, try to assess if users’ questions would be better answered in a table or list format. 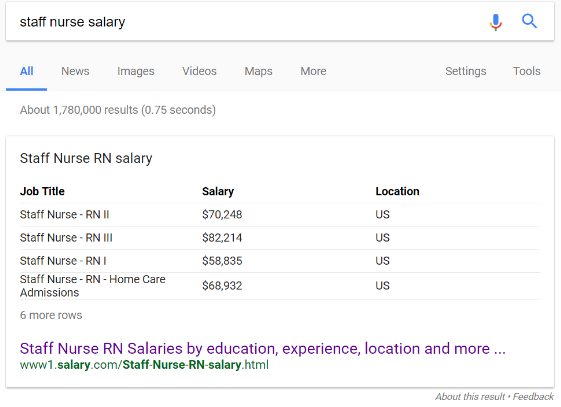 Table formats typically appear for more robust questions that need various pieces of organized information to fully address the answer, such as nurse salary ranges. List style answer boxes appear for questions that require individual steps or a long list. 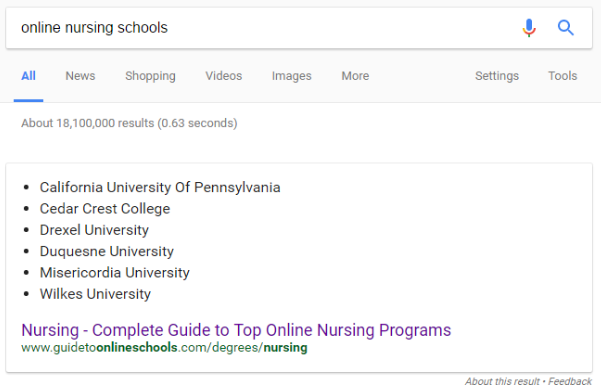 Such as “types of nurses” or “best colleges in PA.” Google heavily favors content that is in a numbered or bullet list format for these types of search queries. How do you rank in the answer box for a specific query? Now that you know the common types of answer boxes, you’re ready to start creating your content. The two most important ways to obtain answer boxes results is by addressing the users’ queries first and foremost, and then optimizing the answer in a user preferred format. Audience: Is my content directly answering users’ queries about the topic? If not, tweak the content to directly address the user’s question in the best way possible. SERP Landscape: Is there currently an answer box appearing for related terms? Yes: Does the current content ranking in the answer box have a helpful format that clearly addresses users’ questions that you’d want to emulate in your content? No: Would an answer box help users answer a query related to my content? (Refer to the common formats above and reflect on what format would make sense for your content). Just because Google is not currently showing an answer box for a search, does not mean one won’t appear in the future. Perhaps no one has created content that is relevant and purposeful enough for Google to rank in position 0. Using audience research to guide you, test out different formats that you think would best answer users’ questions for your piece of content. Optimizing: Is my content formatted correctly for the answer boxes? Is the answer quick and easy to find within the content? Is the question and answer presented in the relevant user preferred format (tables, lists, or paragraphs) with proper markup? Identifying users’ preferred format is truly the secret to success when it comes to answer boxes. 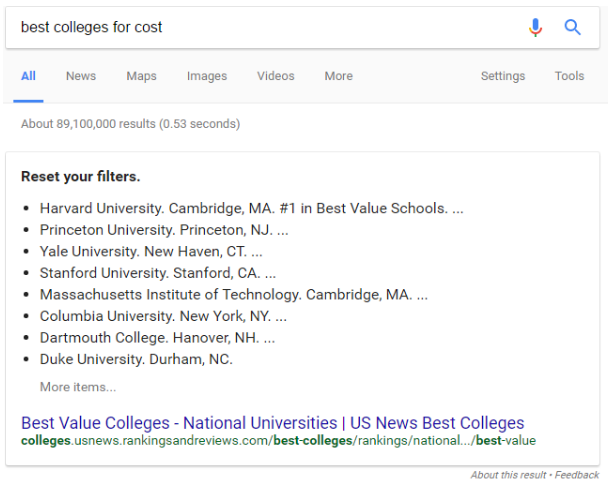 As Google continues to add more answer boxes in the SERPs, marketers can find areas where the answer box is displaying the “wrong” type of snippet, aka a format that doesn’t provide users with a format that answers their questions. For example: “[online nursing schools]” isn’t using a clear table format, instead it’s showing a bulleted list. A table with facts next to each school would better address this search query. After choosing the correct format, it’s important to pose the related question in an h2 or table header, while including the answer in a table format. The page should also be marked up to include the correct code such as <table>. In February 2016, Seer and one of our education clients optimized a Nursing Salary Guide for answer box results. 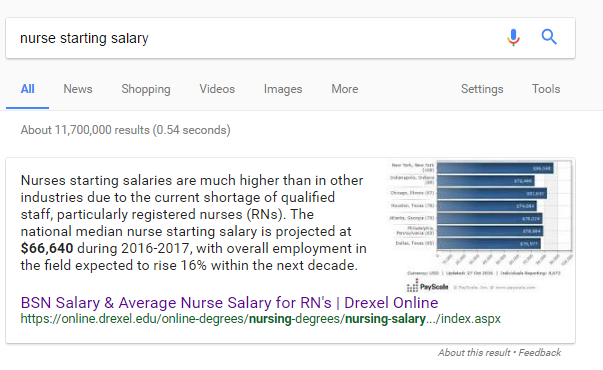 The guide provides information to potential nursing students when they first begin seeking degree information online, such as what is the average starting salary of nurses? After analyzing the SERPs and reviewing audience data, we came to the conclusion that paragraph formats would be the most relevant type of answer box format to optimize for, as users are looking for a quick answer when searching for this information. After tweaking the copy, we altered our H2s into questions and answered the question directly in the copy beneath the headers. 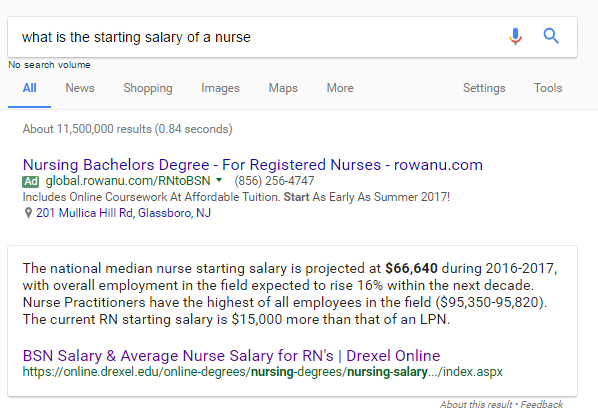 Since mid-June this page has ranked in the answer box result for “what is the starting salary of a nurse” and other related keywords. Behind the organization’s homepage, this guide is the second highest traffic source. Crazy to think that before we had optimized this page, the guide had barely made it into the top 20 ranking positions! In addition, the answer box result has begun to pull in images from the page, showing that Google includes different visual formats and information over time depending on what will best answer users’ questions.